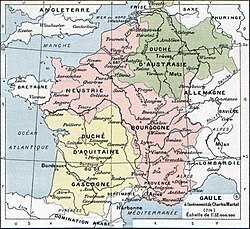 The predecessor to Neustria was the Roman rump state of the Kingdom of Soissons. 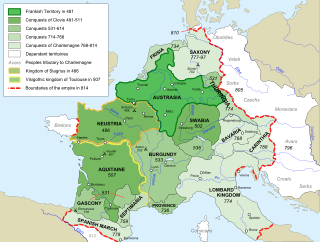 In 486 its ruler Syagrius lost the Battle of Soissons to the Frankish king Clovis I and the domain was thereafter under the control of the Franks. Constant re-divisions of territories by Clovis's descendants resulted in many rivalries that, for more than two hundred years, kept Neustria in almost constant warfare with Austrasia, the eastern portion of the Frankish Kingdom.